09/01/2019 Hark the herald - Harrogate is here! 21/11/2018 Are you switched on? 17/01/2018 See you in 2019! 11/01/2018 Your tickets are waiting! 22/11/2017 C&G - The BIG night out! 03/01/2017 Just a few days to go! With the majority of the UK’s Christmas light displays now in full illumination – like London’s Convent Garden with an iconic 55-foot British grown handpicked Christmas tree decorated with over 30,000 lights – consumers are now in full-blown festive shopping mode. For many in the retail sector this coming ‘Black Friday’ will mark the launch ‘button’ to open purses around the country with people everywhere out to grab a bargain. However, according to YouGov many retailers are missing a beat as advertisement campaigns are not reaching the 18-24 year age group effectively and maximising the right channels to engage younger people. A re-think in strategies for next year could provide a huge boost to pre-Christmas sales for 2019. This includes a ‘must visit’ to Harrogate Christmas & Gift to have a heads up on the hottest new products before they hit the market. SIL clearly thinks we’ve all been very good this year, because its range for Christmas is a proper treat. Little ones will love the cheeky little elf – find him on mugs, Christmas stockings and sacks, stationery, decorations and toys. There’s also a special plate to leave out cookies for Santa – and carrots for his reindeer, of course – decorated with a cute gingerbread family. Mums and dads can ‘get into the Christmas spirit’ with a host of booze-themed glassware, candles and gift boxes and bags; or an exquisite collection of Santa-themed snow globes, diffusers, candles and tea light holders. When you’ve had your pick, wrap it up in their super-sweet doggie gift bags, with a dachshund and pug – that are definitely not just for Christmas! All Aboard the Santa Express! For all the most important festive trends of 2019 look no further than Widdop and Co. The company’s spectacular life-sized Santa Express train will roll into Harrogate, packed full of decorations and giftware designed to maximise your Christmas turnover. From the rich red opulence of A Royal Affair to its enchanting, blush Fairy Queen collection, it has the perfect range for any consumer. Whether you cater to traditionalists or the fashion forward, Widdop and Co is the place to go. 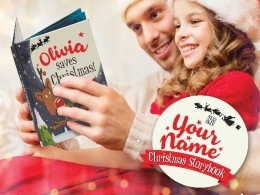 Christmas is a magical time for children and History & Heraldry offers beautifully illustrated personalised story books to make the festivities even more special, giving kids the chance to star in their very own festive adventure – a gift that they won’t forget. There is a choice of two stories, each featuring the recipient’s name throughout, creating a truly immersive experience. Adorable pictures featuring well-known seasonal characters will make story reading time even more joyful. With a selection of the most popular children’s names – as well as blank titles so no-one misses out. The stand is also available with a Christmas resin decoration extension of Festive Friends – a great combination to build your festive impulse buys! Copyright © 2019 Harrogate Christmas & Gift. The Organisers and TouchFinder are not responsible for the content of external sites.